What is a Wild N Sweet Bengal kitten? A Wild N Sweet Bengal kitten has received lots of love and will seduce you, as much by his endearing and affectionate behavior as by his legendary beauty! If you are looking for a high-quality Bengal kitten for sale that really stands out, Wild N Sweet Bengals Cattery is definitely the right choice for you. To succeed in producing the most beautiful Bengal kittens imaginable, you must first have the most beautiful cats possible! 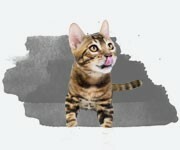 Take the time to look at our breeding Bengal cats. They are simply breathtaking! We work very hard to select only exceptional Bengal cats, and this is reflected directly in the quality of our Bengal kittens for sale. We also produce Bengal kittens with spectacular colors that are highly sought after, which brings our little kittens to travel around the world to join their new families. All of our breeding Bengal cats undergo a series of health tests to screen for various possible hereditary diseases, including HCM (heart) by a specialized cardiologist. These measures avoid many problems for our cats, our Bengal kittens for sale and their future owners. The temperament of the Bengal kitten you are going to buy is of the utmost importance, because that will determine your bond, attachment and love for him. For a Bengal cat to be kind and affectionate, he must have been socialized and cuddled from an early age. The first months at the cattery are very important. At Wild N Sweet Bengals, our mini leopards are born and grow in the heart of our living room. They get a lot of love and are petted throughout the day, so as you can imagine, they are wonderfully socialized. Our Bengal kittens for sale are simply adorable. And since the temperament is often hereditary, we select breeding Bengal cats with the best possible personality which makes all the difference. Our Bengal kittens for sale are always offered to people on our waiting list first. Contact us to subscribe to our waiting list. Please note that you can request information about all Bengal kittens for sale, even if they are already reserved. In rare cases, they may become available again. Calypso is extraordinarly beautiful ! She has been for 5 years now the mainstay of our silver program. Always producing outstanding little Bengal kittens. It is now her turn to live the life of a pampered pet. Calypso will be looking for a home without any other pets and no young children (because of her wild instincts). She is a very affectionnate girl who loves the company of her owners. We will be very selective with the choice of her new family. Want to adopt one of our kittens? After over a year of research, a failed adoption attempt which resulted in a large lost deposit, and inspecting seemingly every Bengal breeder in North America, my husband and I decided upon WildnSweet. Initially, it was their professed values, quality of their cats, and business acumen (expressed via a highly functional website) that attracted us to them. After communicating with Sabrina for some time, however, we were convinced that this was the right place for us. She was responsive, honest, and genuinely concerned with finding the right Bengal(s) for us even if it meant not having a cat for us for months. Here we are almost a year and two Bengals later and we still couldn’t be happier with our cats or the experience we had with WildnSweet. She has continued to show her care for the cats and commitment to her customers through this entire process. Our little monsters are full Bengal but also clearly display behaviors that indicate they were well raised with a great deal of love and attention. We are incredibly grateful to have found WildnSweet and have recommended them to our friends and family as a result.